First a note about our trip from Key West to key Biscayne. We sailed in the Hawk Channel which is a wide, shallow area south of the keys. Initially I had planned to cover the entire distance without stopping, but navigating the channel with only the two of us, especially at night would have been a test. During the 3 day trip we averaged 8 course changes per day and in some places being a half mile off could have been disastrous. There were also convenient anchorages about every 40 miles so I decided to break into day trips. The Key Biscayne to Vero Beach leg was about 120 miles and during my planning I expected to average 6 knots. The winds were forecast to be 8-12 knots which gives us about 4.5 knots of boat speed and 1.5 knots of gulf stream current. We were staying close to shore so wasn’t expecting much from the gulf stream. Sails were up about 10 AM which, if my calculations were correct we would arrive around 6AM – 30 minutes before sunrise perfect. Initially we were moving along at 5 knots so I decided we needed more sail. For the first time we raised the staysail. 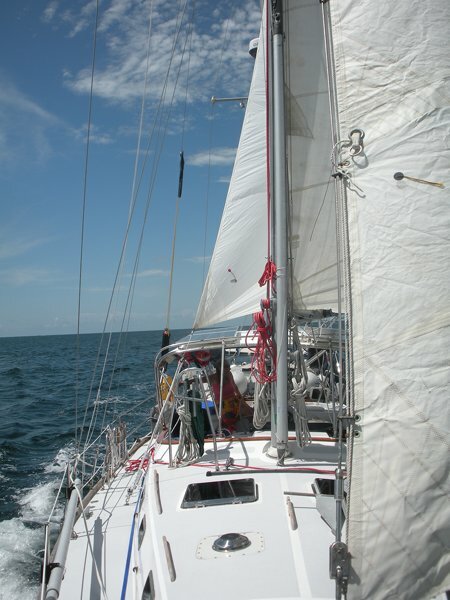 Then I realized that the winds would allow us to also use the mizzen staysail so that went up too. Now off the coast of South Beach Miami we had 5 sails up and were moving along at 6 knots. Life was good. We sailed along with the 5 sails for about 2 hours and then the wind shifted and the mizzen staysail had to come down. The wind had picked up and we were starting to feel the benefits of the Gulf Stream so we were still doing 6 knots. It was time for me to take a break so I took a nap in the cockpit so with Roberta at the helm I dozed off. At one point I noticed the boat felt like it was moving fairly fast and asked Roberta how fast were we moving and she said 9.5 knots. Great I thought and resumed my nap. Now it was Roberta’s nap time so I took over and our Gulf Steam aided speed is now in the 10+ knot range. 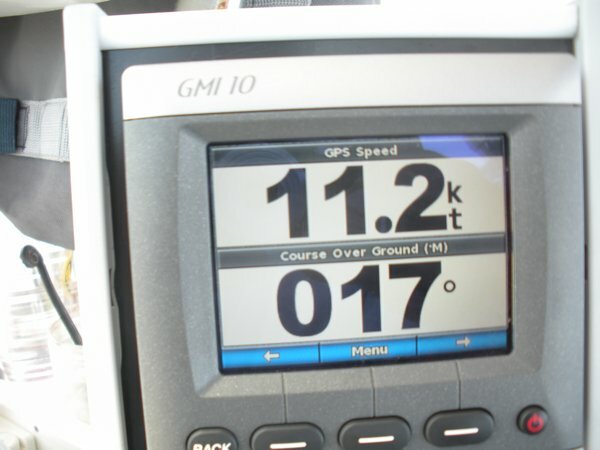 Here is a one picture I took as the speed routinely topped 11 kts. With speeds like this I wanted to keep going – who needs Vero Beach. If we continued at this speed we would arrive at the inlet in the middle of the night, something I didn’t want to do. Entering a port for the first time at night can be a recipe for disaster so I needed to slow the boat down. About sunset we took down all sails except the main and we were still doing 5 knots, 1.5 knots from the sails the rest from the gulf stream. The problem was I didn’t want to go past our destination and then have to fight the current back. This problem lead to a very interesting solution, sail 90 degrees to the direction I wanted to go. Most would say so what, but even with a 90 degree turn we were still doing 4 knots in the right direction. Here is what the chart plotter showed. The purple line is the track we should be on to stay on course. The dotted line is our actual track, so you can see we are being pushed to the right. The picture of the boat is the actual heading of the boat as we try to get back on track. The 4.0 in the upper left corner is our speed over the bottom and the 353 in the upper right is the direction the boat is traveling. 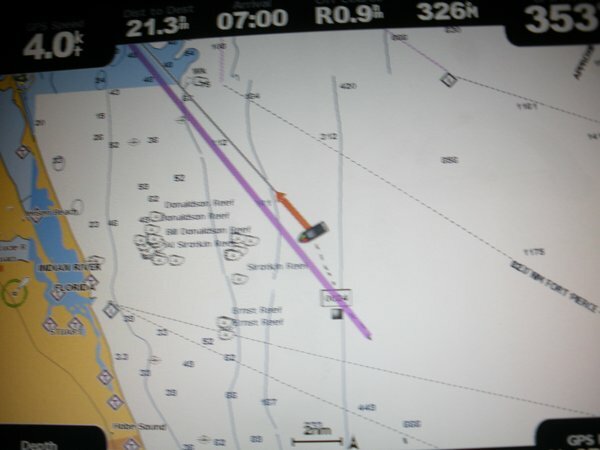 The red arrow is the chart plotter telling me to “Go that way dummy, your destination is over there.” Note: North is at the top of the screen. In the end we were able to sail to within 5 miles of the port and then we motored the rest of the way arriving at 6:30, so it all worked out.